Well, let me tell you that I loved the colours on the sketch so much I tried my best to replicate them, although on the screen here there seems to be pink and when I printed it the circle, sentiment, banner and lighter part beneath all printed white, so that's what I used in my card. 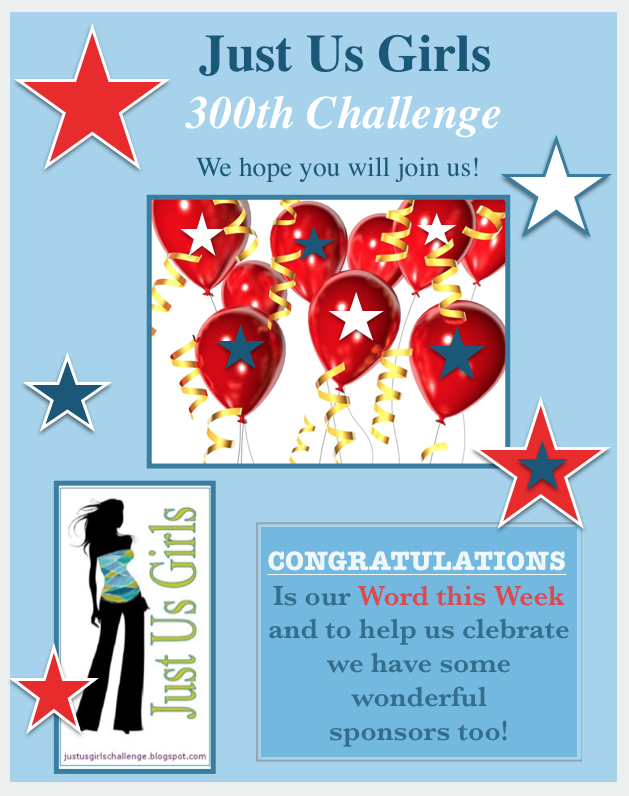 Additionally, I'm entering this in the Just Us Girls Challenge (my first ever). I added a line of butterflies rather than keeping the banner blank and added a gem trail for my larger butterfly. I hope you like it! I need to get back in to my swimming tomorrow so we'll see if I manage to make any more cards this week. Thanks for stopping by! Very pretty! I do like the sketch and your bfly banner - Thanks for joining in at JUGS 300! Thanks Vicki, and thanks for stopping by and commenting too! 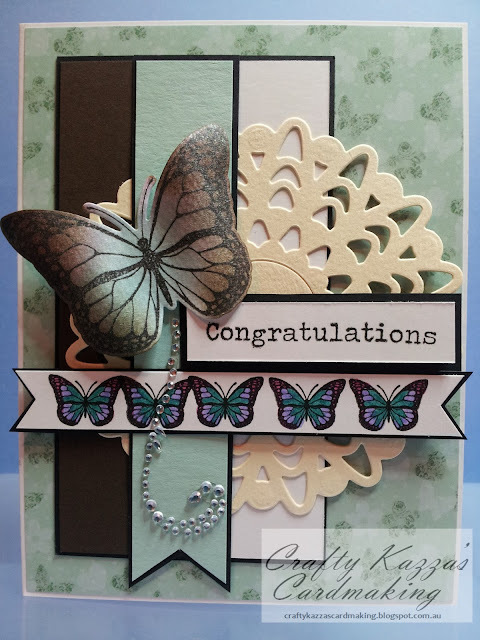 Karen I just love your card, it is beautiful, the colours are lovely and I adore that butterfly!!! Thanks "the lovely Marcelle" :o) Thanks also for the sketch, it's totally different to anything I've done before and it was so much fun trying to replicate it! WOW Karen you have done a fabulous job on this sketch. You matched the colours beautifully and I so love that big butterfly. 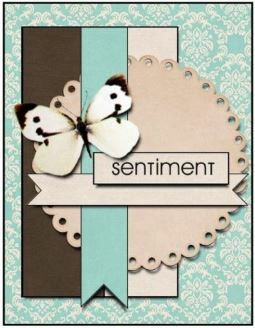 The little butterflies add just that something extra. Thanks so much for joining in our 300th challenge at Just Us Girls. Hugs Ina. PS Need to work on my take on the sketch. I agree~great colors and sketch! 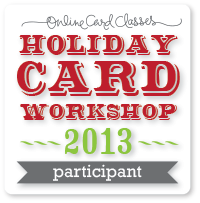 YOur card emulates both perfectly and it's beautiful! Very peaceful! Thanks for joining us this week at Just Us Girls! Thanks so much Cheryl, I will have to check out some of the other challenges there (colour ones usually stump me lol). Thanks for stopping by and commenting! This card is absolutely GORGEOUS!! Love your take on that sketch! Thanks for joining us at Just Us Girls! I adore this card you made Karen. It is certainly a fabulous sketch that Marcelle gave us to work with. I'm pretty sure I'll use it again! Thanks Cheryl! It sure took me out of my box, I love how all the layers look clustered together like that. I reckon I might have to have another play with that sketch in the future too!